BizReport : Research Library : Rex Direct Net Inc.
BACK TO REX DIRECT NET INC.
By: Rex Direct Net Inc.
Online lead generation is a burgeoning industry and a crucial part of marketing a business on the Internet. However, because this is a relatively new industry, it can be challenging to get started and best practices are not well established. The purpose of this article is to explain what lead generation is and to educate businesses about best way to go about this process. Lead generation is a marketing process to find and nurture consumer prospects until they become paying customers. To find their ideal consumer demographics, businesses can use media channels such as email, banners, social media, search (pay-per-click & search engine optimization), and co-registrations (sharing registration information with another site). Once potential customers click on these offers and opt in by providing contact details, the merchant is allowed to develop a relationship with them by communicating via phone, direct mail and/or email. Over time, trust is established and a percentage of leads turn into customers. 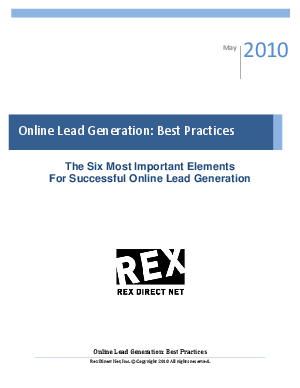 The greatest results from a lead generation program stems from the following best practices.